October 2014 saw the beginning of an e-mail campaign spamming malicious Microsoft Office documents. Mostly Word documents using the “old” binary format, but sometimes Excel documents and sometimes the “new” ZIP/XML format. All with VBA macros that auto-execute when opened. Yesterday, we started to see XML attachments. You might expect that these attachments open with Internet Explorer when you double-click them, but if you have Microsoft Office installed, they will open with Microsoft Word. The XML file contains an element (w:binData) with a base64 string as content. Its attribute (w:name="editdata.mso") reveals it is a MSO file. 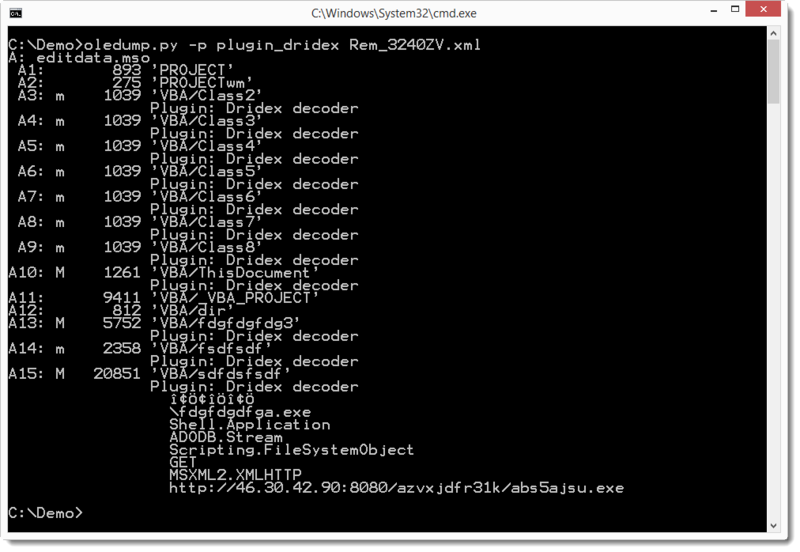 Decoding the base64 string, we end up with a binary stream with header ActiveMime. 50 bytes into the stream (position 0x32), a ZLIB compression object starts. Inflating this object reveals an OLE file (header 0xD0CF1LE0) containing the VBA macros. This OLE file can be analyzed with my oledump tool I mentioned in a previous diary entry , but I just released a new version  that handles XML files directly. And Philippe Lagadec already released a new version of his olevba tool yesterday . Both tools are Python programs, giving you the means to analyze malicious Microsoft Office documents in any environment supporting Python, without Microsoft Office applications. 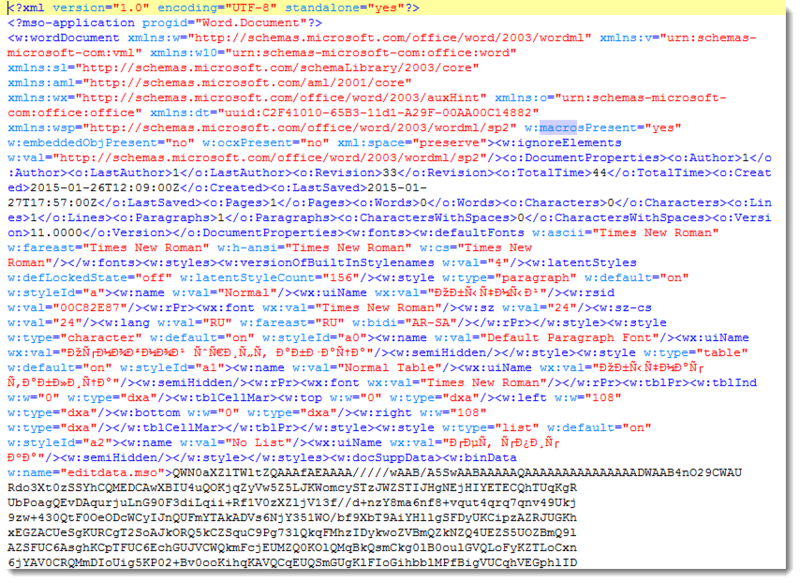 If you filter e-mail attachments that are Microsoft Office documents, you should check what your e-mail filter does with XML files. XML declaration identifies the XML file as a Word document, and attribute w:macrosPresent="yes" (of element w:wordDocument) indicates the presence of VBA macros. Remark that these strings are different for XML Excel documents. Until now, we have only seen XML Word documents. Please post a comment if you received another format, like XML Excel documents, if possible with a link to the VirusTotal entry. The MD5 of the sample discussed in this diary entry is 77739ab6c20e9dfbeffa3e2e6960e156.